Are you considering buying a Sportspower Rosemead Metal Swing Set & slide in the coming days or weeks? 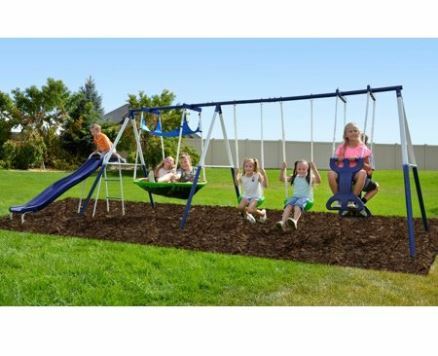 If so, then make sure to check out this brief review which will let you know if indeed this is the right Swing set for you and your kids or not. We will go through and outline all the main features that it has to offer, plus various images and all the main pros and cons that have come up in the past from both our own experiences and also from several other previous buyers across the market. Please note also that guide prices can only be shown at the time of this review as prices can change from month to month or week to week depending on local promotional activities so please make sure to view the price checkers provided below to ensure you have the most up to date accurate price information. In addition, we have also provided some frequently asked questions and additional price comparison options at the end of this page also that are worth checking out if you wish to explore prices elsewhere…. Q. How many kids can play at once? Q. What is the total weight capacity for the Swing set? Q. Who do I contact if I have damaged or missing parts? Q. Are ground anchors included with delivery? There are two blow-molded swings with safe vinyl chain covers to protect little fingers. Price when last seen on sale at Walmart was in the $190 to $290 region which of course can be double checked below. A large unique 2 seat Roman glider is included with east grip handles to hold onto. Toddler swings can be added where needed but requires extra work on your behalf. One of the main attractions of course is the awesome nest swing which the kids will thoroughly enjoy. Exceeds or meets all ASTM safety standards and overall good value for the amount of money you have to pay and at times can be available for less than $200. Changing to a toddler swing is more difficult than originally thought and changing the swing heights is not easy to do due to the bolt system. Plastic covers for the screws/bolts should be of better quality and packaging in some cases has been poor. Have you or your kids any personal experience with Sportspower Rosemead Metal Swing Sets in the past? If so, then please share your thoughts and feedback with the wider community by leaving a comment in the comment section below – So that they can learn also!!! Posted in Swing Set Reviews and tagged sportspower rosemead metal swing set, Sportspower Rosemead Metal Swing Set review, sportspower rosemead swing set, Sportspower Rosemead Swing set review. You are very welcome and thanks a million for stopping by and leaving your feedback – it is very much appreciated.